While to some this is not a true martini; some claim a true martini is solely gin with an olive, forgoing the vermouth and instead whispering sweet nothings in Italian over the drink when preparing the cocktail (some of the best dry vermouth comes from Italy); this is James Bond’s preferred movie drink. 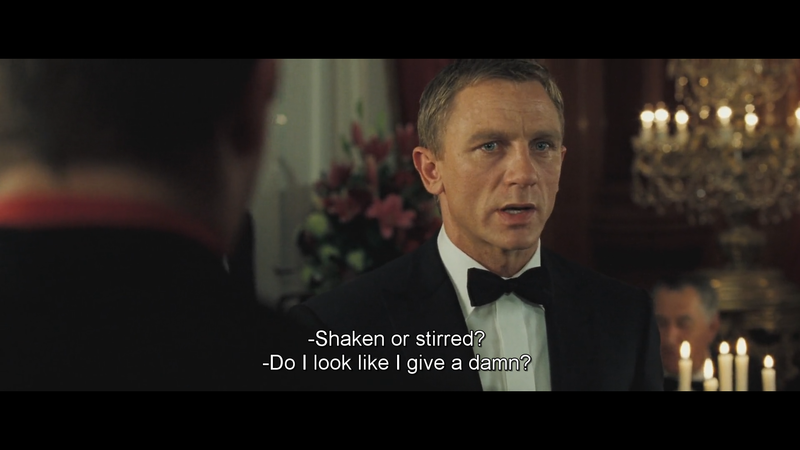 As to the “shaken, not stirred” controversy: shaking “bruises” the gin/vodka; “bruises” is a pretentious word for changing the taste of the gin by shaking; more of the ice melts since shaking like you’re an abusive father breaks off small shards of ice (but chills the drink faster than stirring). On the other hand, cocktails made from “oilier” vodkas benefit from shaking because the oil is better dispersed through shaking than stirring. Shaking also creates tiny air bubbles so the drink will temporarily appear cloudy, but will have become clear by the time the bartender adds the garnish and serves the drink with a wink. Long story short, book Bond prefers his drinks as cold as possible and the quickest way to do this is to shake with ice. A better way is to keep the cocktail shaker, the gin, and the glass in the freezer until needed. Add the vodka and vermouth to a cocktail shaker full of ice. Shake, then strain into a martini glass. Garnish with olives.